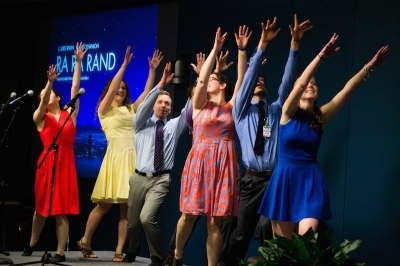 Last year's inaugural RAND’s Got Talent set a high bar, but the performances by Pardee RAND students and RAND staff on March 3 prove that yes, RAND continues to have significant talent, and not just in the field of research. Master of Ceremonies John Luke Irwin (cohort '16) introduced and participated in the evening's first comedy sketch/musical parody, "Ra Ra RAND." Also starring Claire O’Hanlon ('13), Felix Knutson ('16), Hilary Smith ('16), Diana Carew ('15), Lauren Kendrick ('12), and John Speed Meyers ('15), and with the tech support of Uzaib Saya ('16), this skit told the story of a downhearted wonk-to-be who gets a chance at research stardom. Next up was our own Angel City Chorale member, executive assistant Jennifer Prim. She shared her angelic voice with the audience, singing and playing an original composition called "Refuge." Steve Davenport ('15) revisited his SNL Weekend Update parody, "RAND Update with Steve and Simon," this time featuring John Hamm ('15) instead of Simon Hollands ('15). The comedy sketch included such elements as "Honoring the Fallen," "Reports from the First Years," and a weather report on "Hurricane John Speed." RAND research assistant Madeline Magnuson was up next, singing the Israel Kamakawiwo’ole version of "Somewhere Over The Rainbow/What A Wonderful World." The evening then concluded with Etienne Rosas ('14) and RAND project associate James Syme, a.k.a "The RAND Band," rocking out to "Santeria" by Sublime as well as "Bohemia" and "Bang Bang" by Rosas' original band The Revies. Asya Spears (cohort '15) took photos of the event. Click any image to see a larger version. A Legend in His Own Time: Remembering Charles Wolf, Jr.